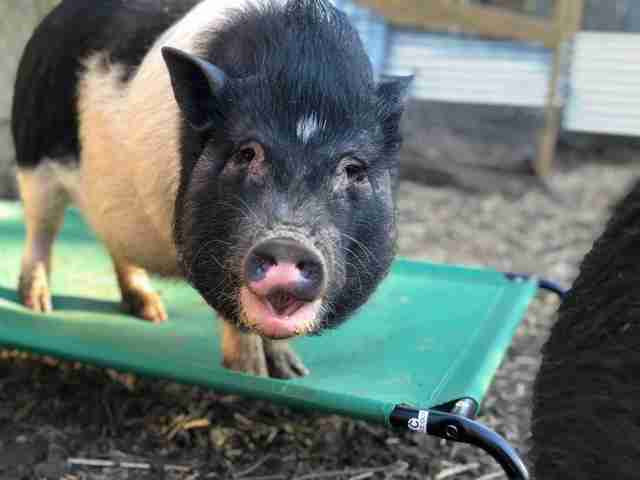 “I can’t emphasize enough that people should NOT get a pig because they want it to be like a dog … it’s a pig, not a dog." Justin Miller has always had a soft spot for animals, and began welcoming rescue dogs into his home several years ago. 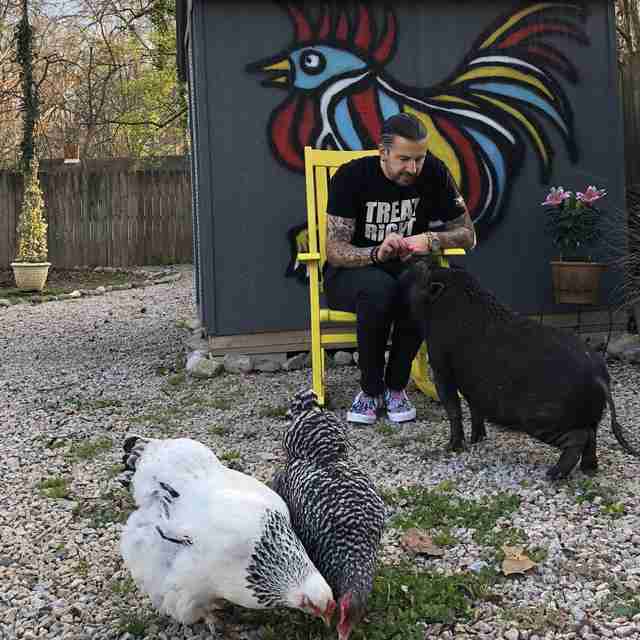 He loved the joy and personality each new addition brought into his life, and eventually decided to turn his home into a little mini farm and began raising chickens in his backyard as well. 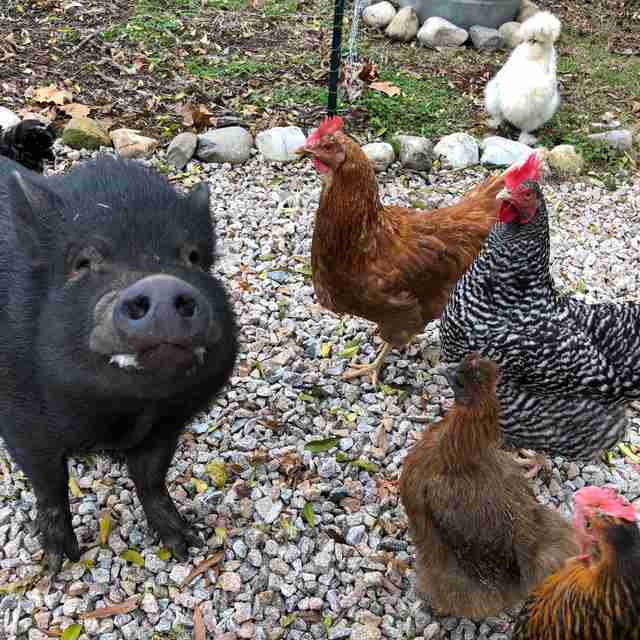 With a house full of dogs and a backyard full of chickens, one might think that Miller’s home and heart were full to capacity — but then he found out about Theodore the pig. Theodore was taken in by Wake County Animal Shelter in North Carolina, and when no owner had claimed him after 72 hours, he was sent to an auction, as is the shelter’s policy. Unfortunately, many people who attend these auctions purchase the animals in order to eat them later on, and as soon as Miller found out about Theodore through the shelter, he knew he had to save him from that fate. Poor Theodore was in pretty bad shape when Miller first took him home from the auction. He’d been on a diet of dog food up until that point, and so he was bloated and gassy, and had terrible skin problems. 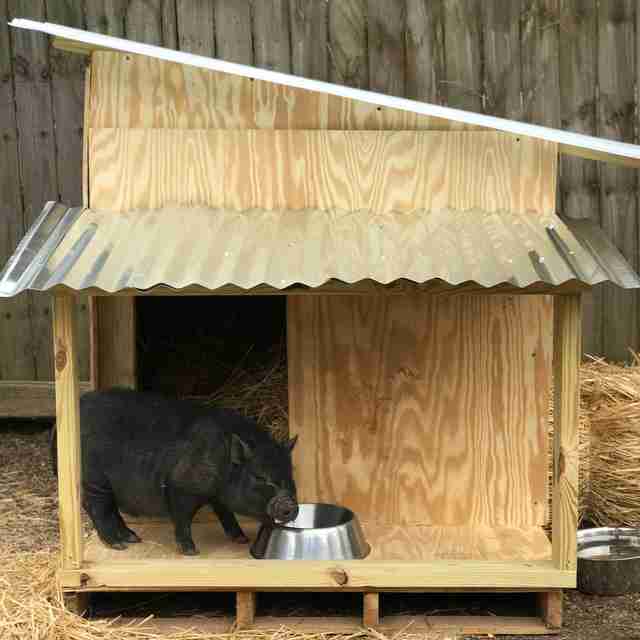 The poor pig was desperately looking for a second chance, and so Miller decided to welcome him into his new home in style — with a brand-new pig house, just for him. As soon as Theodore was settled into his new home, he began to thrive, and his sassy, silly personality came shining through. 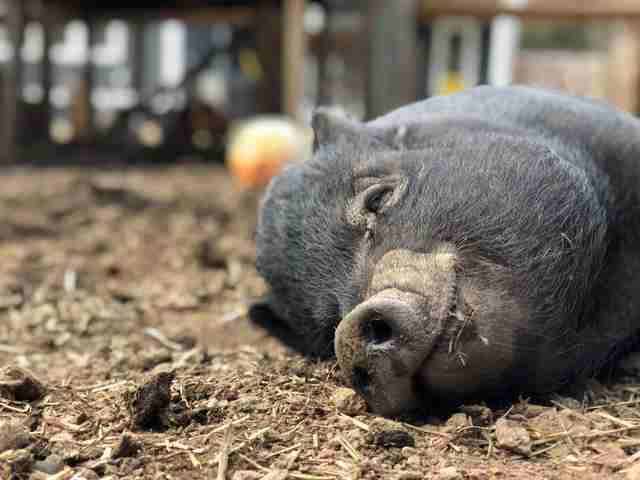 Miller was so thrilled with how well Theodore was doing and how happy he was that he decided to adopt another pig. Talulah was abandoned and left to run loose for several months before she was found and taken in by the Asheville Humane Society. 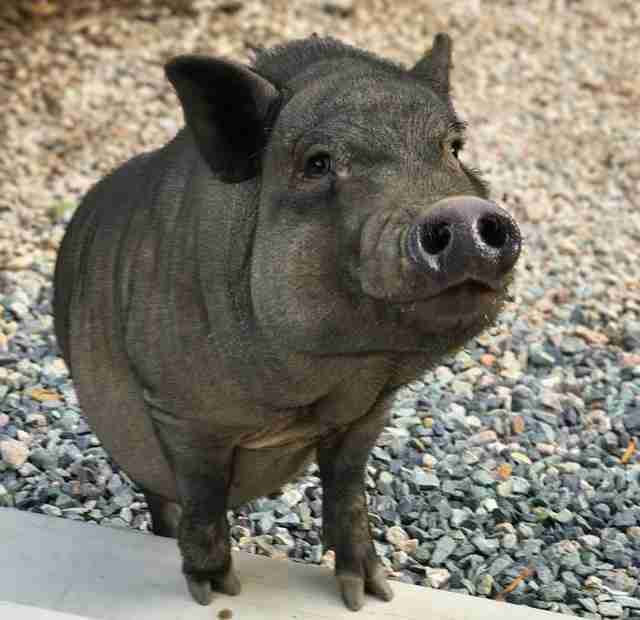 Unfortunately, Talulah was at the shelter for five months with absolutely zero interest from adopters, and as more and more pigs were being taken in, eventually, the shelter just couldn’t keep her anymore. 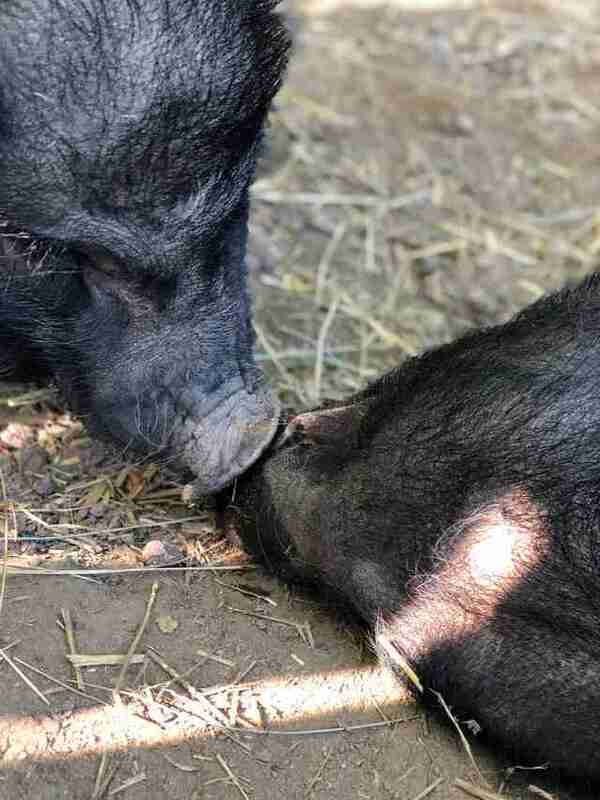 They put out a desperate plea on their social media accounts, hoping someone would connect with Talulah, and, of course, Miller immediately fell for her. The shelter where Talulah was living was five hours away from where Miller lived, and since Talulah was running out of time, Miller knew he needed to formulate a plan as fast as possible, even if it had to be a little crazy. Miraculously, Miller was able to find someone through his stepbrother who was heading to Greensboro that night, which is an hour from where Miller lives. After the man got over the shock of what Miller was asking him to do, he agreed — and proceeded to pick up Talulah and drive her for several hours, away from her dismal start to life and toward her brand-new forever home. Talulah is the exact opposite of her brother Theodore. She has some vision loss in her left eye, so she’s naturally much more shy and reserved than Theodore is. It seems as though she had some bad experiences with people in the past; when she first arrived in her new home, she was terrified of everyone. As the months went by, though, Talulah began warming up to her new home and her new parents, and she’s now as happy as can be. While it took a little while for Talulah to warm up to her parents, it did not take her long at all to warm up to her new brother Theodore. Talulah was adopted in order to be a companion for Theodore, and the plan worked exactly as Miller had hoped it would. Now, the pair are the absolute best of friends, and love spending every minute of every day side by side. 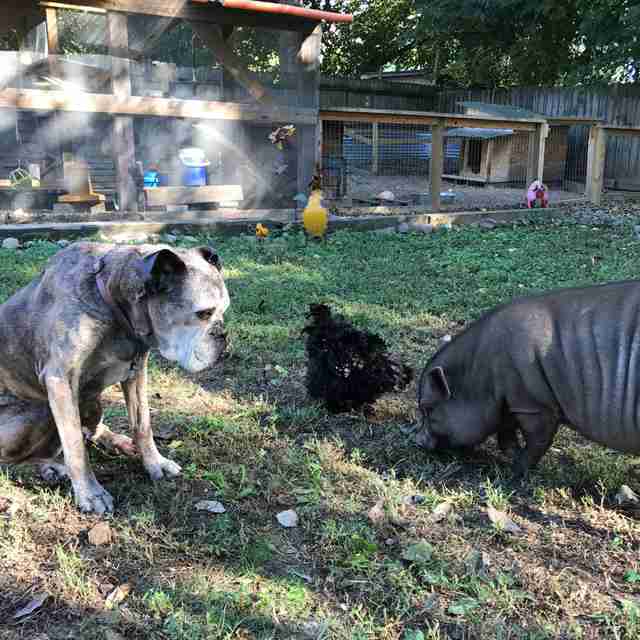 While Talulah and Theodore don’t pay too much attention to their dog siblings (unless food is involved), they live in harmony in the yard with their chicken buddies. 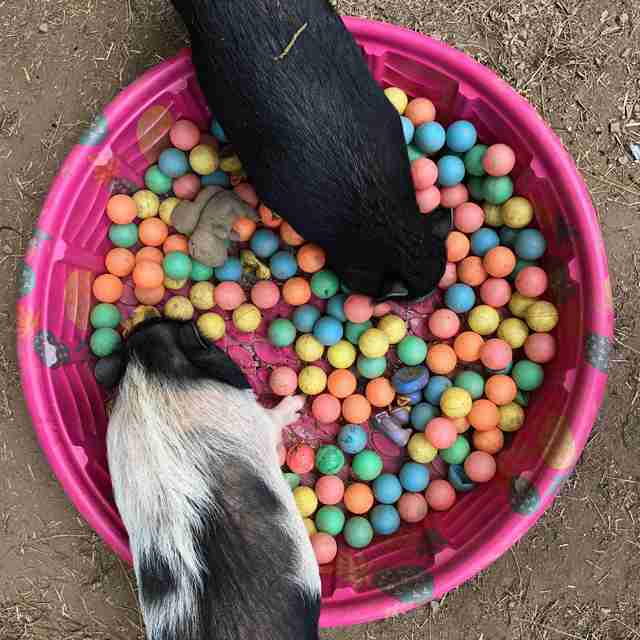 They love rooting around in the yard, and the chickens will follow close behind, pulling up any worms and bugs left in the wake of the pigs. They make a perfect squad, and their dad loves seeing how happy they all are together, loving every minute of their happily ever after. 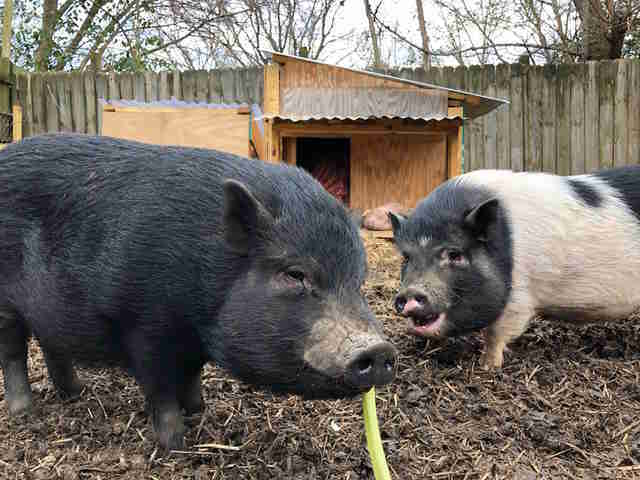 Both Theodore and Talulah were likely originally sold as “mini pigs,” and when they grew into normal-sized pigs were sadly abandoned. 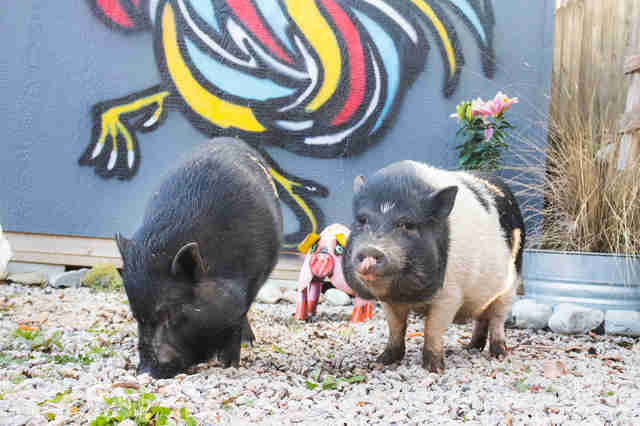 The mini-pig craze has caused so many pigs to be abandoned and left to fend for themselves, and Miller is trying his best to educate people about caring for pigs, so that other pigs don’t end up homeless the way Theodore and Talulah did. 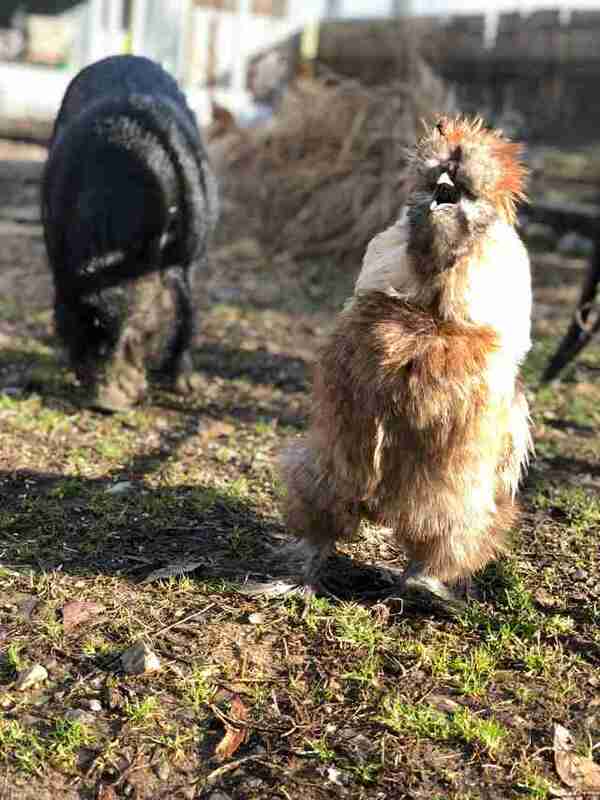 You can follow Talulah, Theodore and their dog and chicken pals on their Instagram account.